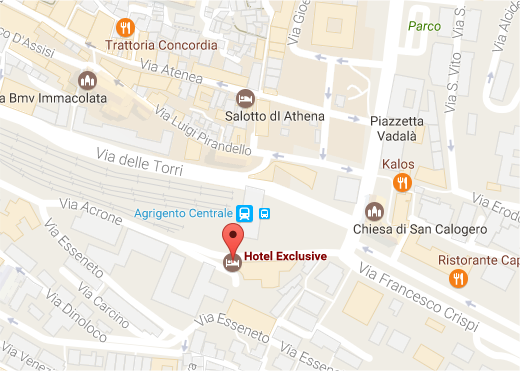 Hotel Exclusive is in the heart of ancient city of Agrigento near to the central station to the sanctuary of St. Calogero, to Viale della Vittoria Avenue and Via Atenea: the main shopping city centre. Just a short distance from the bus stop. Take the SS189 state road towards Agrigento, follow the directions for Centro and Stazione. The hotel is located next to the railway station of Agrigento. Take the A19 Catania – Palermo motorway and after Enna, take the exit towards the SS640 Caltanisetta – Agrigento state road. Follow the directions for Centro and Stazione. The hotel is located next to the railway station of Agrigento. Take the SS115 state road towards Agrigento, then follow the directions for Centro. The hotel is located next to the railway station of Agrigento. Catania – Fontanarossa International Airport.